I’m not a dancer. This isn’t an attempt to solicit a compliment or to lower social expectations if the event should arise that I must dance in front of others; it is just a simple fact. It is not even a question of ability; I just don’t feel comfortable dancing and find it mentally difficult to understand how others can boogie the night away in a rhythmic euphoria of steps, moves, and gyrations. At least that was my mindset in the U.S.
We have all heard the stereotype that all Latin American people, especially women, can dance. While I had several interesting conversations about this with my Chilean friends (it is not true and quite offensive, so don’t spread that nasty generalization), I did find that music is more present in Chilean culture, and it is more common to dance at parties and social functions than in the United States. This cultural propensity for expressive movement made me a bit nervous the first time I was dragged (literally, we are talking about a fear of dancing that I have here, people) to a club in Santiago. Would I be expected to know some crazy American steps? Would any one dance with me? Would others publicly scorn me and make a wide circle of nightclub shame around the gringa? As we can see, some of these fears were slightly paranoid and hyperbolized, but needless to say, I was more than a little apprehensive when walking into the warehouse/reggaeton club. After all that fear, I was pleasantly surprised that not only does my body actually move in ways that could be called dancing, but that I actually enjoyed it. My previous dreadful experiences of preschool dance class (I lasted one day before I asked my mother not to take me back), school dances, and choreographed numbers for drama productions were erased as I swayed with the hundred other youths to heavy bass beats. Not everyone there could have auditioned for a music video, but it was more the willingness to move to the music that was appreciated and welcomed. The atmosphere was more low-pressure and inclusive than my other dance moments. Not only that, but I was asked to dance, or at least I ended up dancing with a very nice boy, as the formal asking didn’t seem part of Santiago club culture. Now, this doesn’t mean that I turned into a major clubber or that I now plan on dedicating my life to interpreting all emotion through dance, but I appreciate more the social role that dance plays in bringing people together. Although I still wouldn’t list dancing as my favorite activity, I now fear it less. Study abroad is above all a chance to stretch your limits, and I can proudly say that I stretched quite a lot. I’ll even dance in the United States now, a little bit, maybe, when no one is looking. 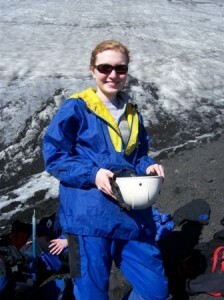 Katie Parker, Junior in History and University Honors College, studied through CIEE in Santiago, Chile for Winter/Spring 2009. Posted in Chile, CIEE, College of Liberal Arts, Spanish, study abroad, University Honors College.